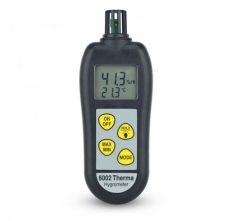 The 6000 & 6002 therma-hygrometers are easy to use relative humidity and air temperature measuring instruments. 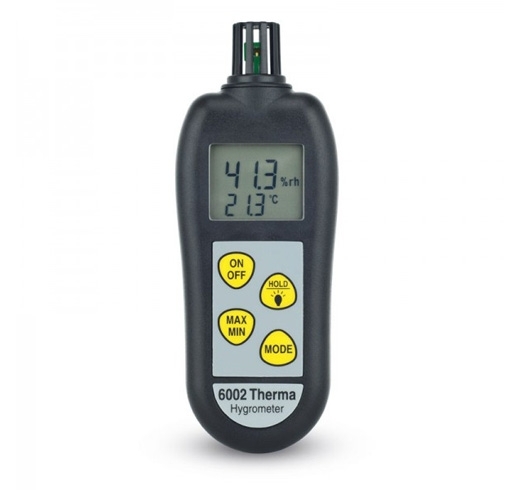 The 6000 humidity meter measures %rh over the range of 0 to 100 %rh with a resolution of 0.1 %rh and temperature over the range of -20 to 50 °C with a resolution of 0.1°C. humidity meters incorporate a clear custom LCD with °C, %rh, max/min, hold and dew point indication. There is an automatic display of both open circuit and low battery. The 6002 displays humidity and temperature simultaneously and additionally incorporates a backlit display. Both hygrometers are powered by three 1.5 volt AAA batteries with a minimum life expectancy of up to 10000 hours. An auto power off facility turns the therma-hygrometer off automatically after 10 minutes, maximising battery life.